Is 123sync the Right FileMaker to QuickBooks Integration Option for You? - Productive Computing, Inc. Here at Productive Computing, we talk a lot about FileMaker to QuickBooks integrations. We even did a webinar about it. This is because: a) FileMaker is a powerful and versatile database platform with (almost) unlimited possibilities to help you organize and analyze your data, and b) QuickBooks is the most popular accounting software for small and medium businesses in the United States. That being said, what makes more sense than to have these two applications communicate and share information? Connecting these two applications via a plug-in (FM Books Connector and FM Books Connector Online) allows users to seamlessly exchange data between the two applications, saving time and money and reducing data entry errors. In this blog we're going to talk about option number 3. Specifically, the 123sync™ Accounting Integrator. The 123sync Accounting Integrator allows you to connect your FileMaker Solution with a variety of QuickBooks' lists and transactions. 123sync, like other integration packages, offers clients a faster and more affordable option to the traditional custom integration. With two integration packages available (Basic and Advanced), you are able to achieve a virtually custom integration at a fixed price. This application was built to communicate with one QuickBooks file and is compatible with QuickBooks Desktop for Windows, meaning Mac integrations require one instance of QuickBooks for Windows and FileMaker for Windows. 123sync gives the user the power to push, pull, modify, and delete various QuickBooks Lists and Transactions. The chart below reflects the functionality of 123sync version 9. Functionality is subject to change and we recommend you check out this functionality chart for the latest updates. - Added new module to the Advanced Integration package to allow users to push and pull Vendor Bill Payments. 123sync will post new or modified check payments to Vendor Bills and pull check payments applied to Vendor Bills in QuickBooks. Credit card payments are not posted. - Added ability to use multiple currencies to the Invoice and Payments module. - Enhanced the Customer list to pull additional Customer information from QuickBooks. 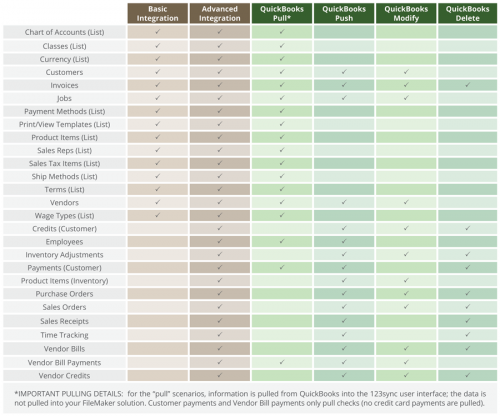 - Enhanced the Vendor list to pull additional Vendor information from QuickBooks. - Enhanced the Payments module to retrieve posted customer payments. As mentioned earlier, there are two integrations packages available. Depending upon your QuickBooks needs, you can either purchase the Basic Integration Package or Advanced Integration Package. 123sync requires a $600 yearly subscription that covers unlimited users and phone technical support. Your subscription qualifies you for free upgrades to the latest versions of 123sync and FM Books Connector plug-in - and ensures your 123sync file is always compatible with the latest versions of FileMaker and QuickBooks. For more information please visit www.fm2qb.com.